At Carter Subaru Ballard we are proud to be your trusted Seattle area Subaru Dealership. Our friendly and knowledgeable Parts Specialists strive to help meet your Genuine Subaru Parts needs quickly and economically. To help make our parts even more affordable we offer our customers monthly Seattle Subaru Service and Parts Specials. Come see our large selection of Subaru Parts and Accessories designed to keep your Subaru running and looking like new. And because they're Genuine Subaru Parts you're ensured quality and reliability. Our Parts Specialists are happy to assist you in finding just the right part for your specific Subaru model. If you already know which part you need you can use our convenient online Parts Request form. Carter Subaru Ballard is proud to be serving Seattle, Bainbridge Island, Bellevue, Tacoma, & Tukwila , Washington. Whether you have a used or new 2016-2017 Subaru, we have the parts you're looking for. 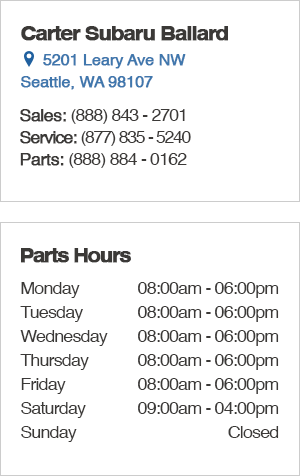 Please use our online form to submit your parts request, or call (877) 884-0162. We are standing by to answer your questions and get you in the door as quickly as possible. Upon submitting your information we will respond to you promptly via your preferred contact method, ask any additional questions required to fulfill your parts needs.